Michael Pipich, MS, LMFT holds a Master of Science degree in Clinical/Community Psychology from California State University, Fullerton, and a Bachelor of Science degree in Psychology from Loyola Marymount University. He is a licensed Marriage and Family Therapist, and has treated a wide range of mental disorders and relationship problems in adults and adolescents for over 30 years. In addition to providing clinical evaluations and psychotherapy, Michael has testified as an expert in many legal cases and has taught several graduate-level psychology courses including psychopharmacology, addictions and counseling. He was selected as a Collaborating Investigator by the American Psychiatric Association, performing clinical field trials for the 5th edition of the Diagnostic and Statistical Manual of Mental Disorders (DSM-5). 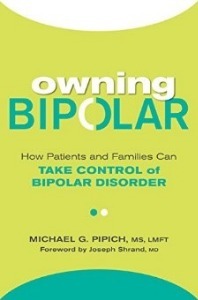 Please visit www.michaelpipich.com and www.bipolarnetwork.com.